Apologies in advance for lack of photos, but hopefully what there is of images along with the descriptions will help. 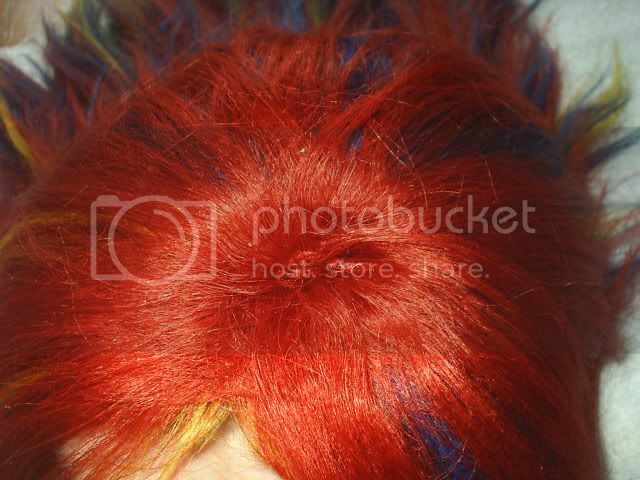 This is a method I have used with success, and possibly one of the easiest ways to make your own wig. Wig Base - An existing wig called an Instant Weave, much like THIS ONE. Hair - All your choice. There are pros and cons to both human and synthetic hair, so think about what you want the hair to achieve for you before deciding. 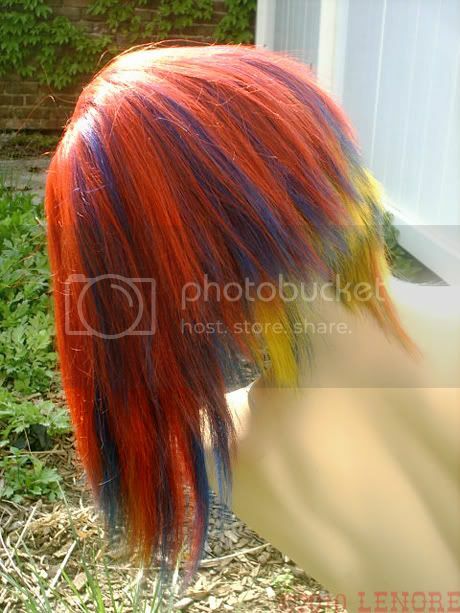 For this particular exapmle, I used 18 inch human hair in blue, yellow and red; the hair comes as one long piece of track or weft [approx 30 inches depending on brand]. Scissors - Should be sharp to leave clean edges on the wefts. Personally, I never use the same scissors to cut hair and everything else. *Please note this wig was constructed using a cosmetology grade mannequin head that was covered with a plastic cap [plastic bag can be used in place of that]. 1. Remove existing hair from the Base. Would highly suggest just cutting off the hair, as you will need the track for stability and other purposes. 2. 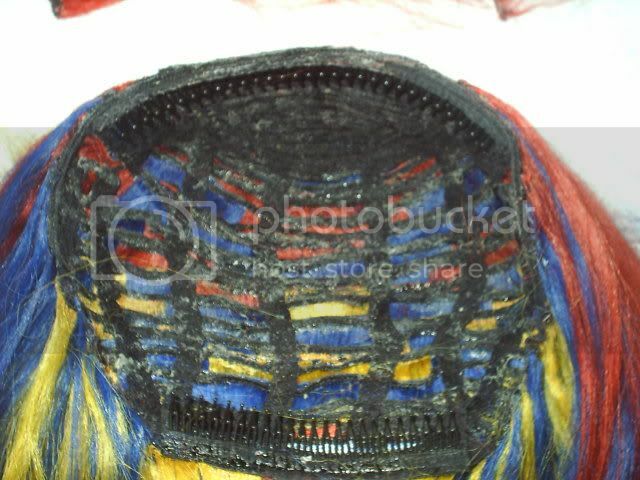 Cut the weft to the length of your first row at the very bottom of the wig base. 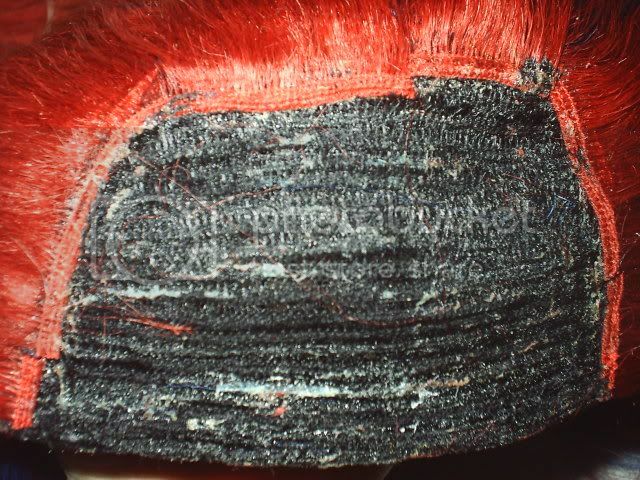 Apply moderate amount of bonding glue to weft and lay horizontally across the wig, following the existing track. Firmly press the weft down to form a good bond; apply heat for 15 seconds if desired. 3. Working from the bottom to the top, repeat until you reach the crown or top of the wig. Now comes the difficult part of finishing off the wig. 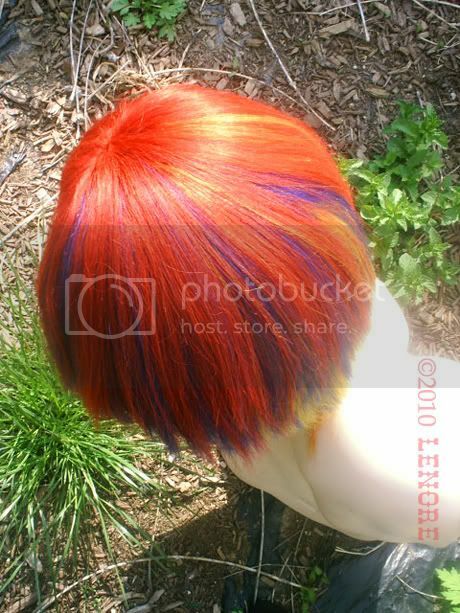 This can be done in a variety of ways, depending on how you want the wig to look. In this example, the hair has been laid horizontally from bottom to top, with the upper layers slowly curving as less and less wig base is visible. Starting at the left, the weft was then laid in a circular pattern, so that hair would hang over the front part of the wig. Continue in this fashion until there is no wig base showing. This part can be very tricky, and I would suggest using a tail comb to get the last few bits in place. 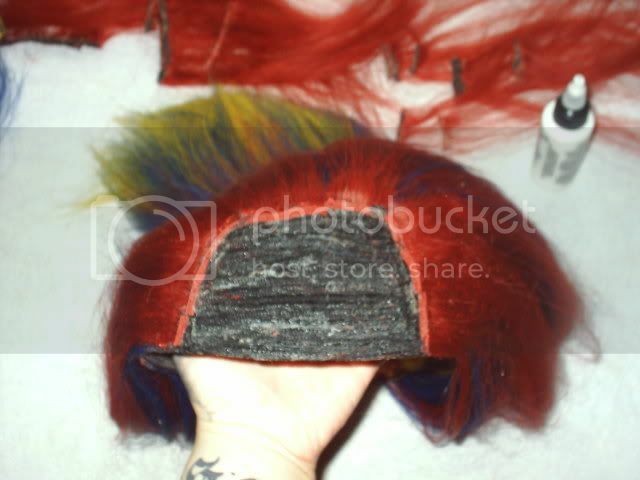 Allow the bonding glue to dry for at least 12 hours before putting the wig on. The front of the wig can be trimmed into a fringe or parted as desired. To keep a part in place, dampen the hair slightly, section, and clip in the direction you want the part. While the hair can be easily styled, avoid excess pulling on the wefts. If for some reason any of the wefts come loose, apply bonding glue and reset with pressure or heat. 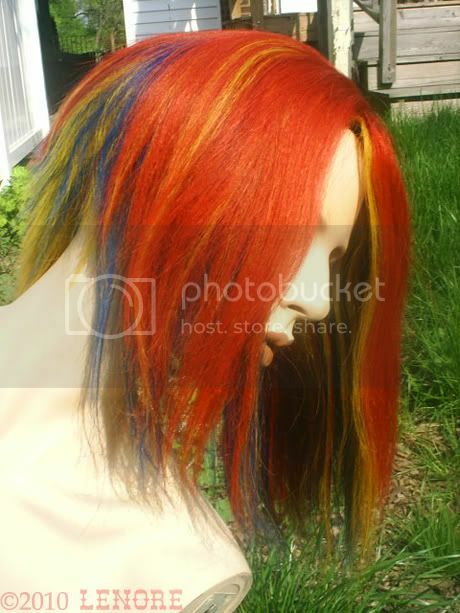 Next time I make a wig this way, I will do my best to get photos and update this. Last edited by Couture_Coiffure on Thu Apr 29, 2010 7:19 pm, edited 1 time in total. this is a great tute! 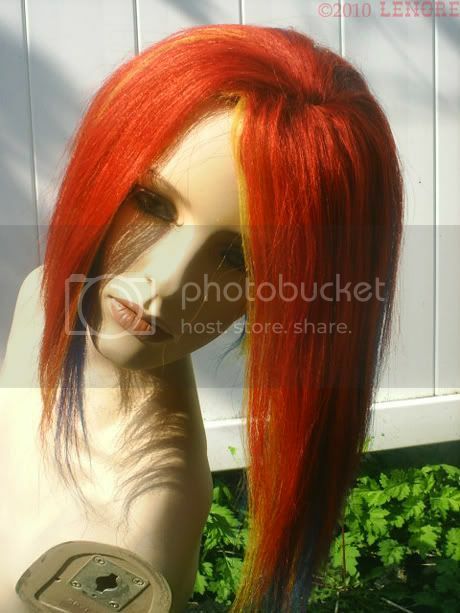 Can you include a long shot pic of the finished wig either being worn or on a mannequin? It would be nice to fully see the end result. Thanks, I was worried that it was too simple. Will definitely add a few shots of the finished wig in a day or so. Additional photos of me wearing this piece can be seen HERE. That is actually AMAZING & looks so simple. I thought it would've been a complete nightmare to make a wig. Wow, this looks really nice! The method of doing it seems pretty straightforward, but I still don't think I'd personally have the patience to ever do it Great job though! so i used this tutorial ant it took me maybe, MAYBE, a half hour to get it all done. awesome. iddylove wrote: so i used this tutorial ant it took me maybe, MAYBE, a half hour to get it all done. awesome. I'm not a fan of glue, I'd prefer to hand stitch the wefts in. so it would probably take a bit longer. good tutorial though. I've been wondering how to do the very top. Cool! Need to try this!